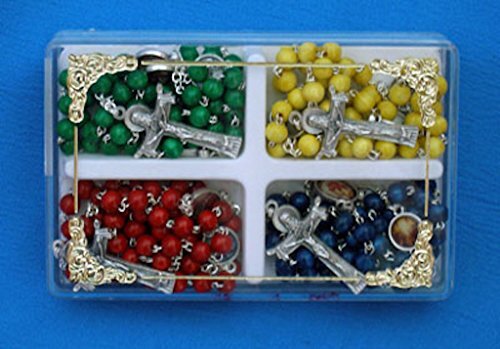 The four rosaries of the Mysteries of the Rosaries. Red - Sorrowful Mysteries, Green - Joyful Mysteries, Yellow - Mysteries of Light, Blue - Glorious Mysteries. 6mm wood beads, 18" L. Made in Italy. RELIGIOUS A shiny brass Holy Water Font, 7.75inches. Made in Italy. A Divine Mercy holy water font in wood-tone with a gold bowl, 3.5x7inches. Made in Italy. Nativity scene by Da Fabriano, print on glass with dark-stained wood frame, 11x13inches. Made in Italy.